In the GO Center, from left, Coordinator for MercerOnline Jill Marcus, students Fabiola Garcia-Morales and Kamil Stokes, Dr. Alexandra Salas, Dean for Innovation, MercerOnline and Student Success, student Julia Simko, and Professor Andrea Lynch, Coordinator for the Center for Global Opportunities. 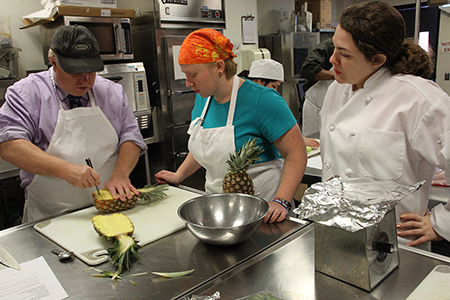 Chris dePagnier, instructor for "Food and Culture" (HOS 115) invited the MCCC community into the kitchen for a hands-on demonstration about foods form Southeast Aisa and the Pacific. 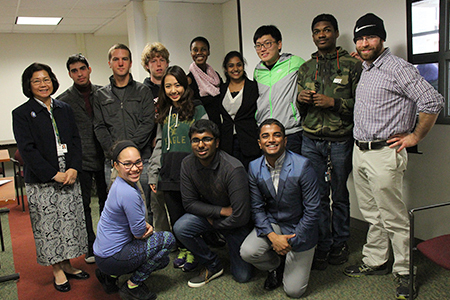 Students shared their international backgrounds and their experiences as students in America during "In My Shoes," hosted by the MCCC International Student Organization. 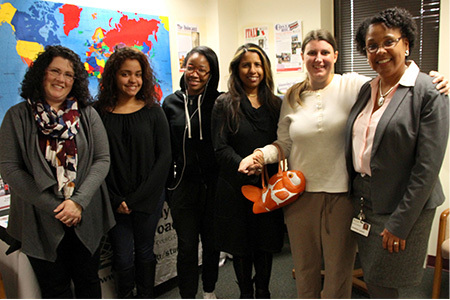 West Windsor, N.J. – As Mercer County Community College (MCCC) observed International Education Week Nov. 14-18, it was apparent that global education is woven into the fabric of the curriculum in a variety of classes every semester year-round. According to Professor of Business Andrea Lynch, coordinator for the Center for Global Opportunities, the college has myriad classes that don’t just touch on international education, but focus on it. During the college’s IEW observance, 12 professors invited visitors to sit in on their class discussions about world religions, food and culture, global economics, literature and more. “Our students are not just citizens of New Jersey or the United States. They are citizens of the world. An understanding of the world beyond our borders is essential in education today,” Lynch said. In addition to professors who opened the classroom doors, the college hosted several special events. “In My Shoes: International Students Talk About Their Cultural And Academic Experience at Mercer” was hosted by the International Student Organization. The lunchtime discussion featured ten students who shared their experiences of either coming to America as children or as international students currently studying at Mercer. While they had clear differences with their American peers – practically every foreign-born student knows more than one language! – they were all of like mind with Mercer students about their serious commitment to learning and the welcoming community they have found at the college. Other events included a presentation by Professors Craig Coenen (History), Jack Tabor (English) and Laura Knight (English), who accompanied a group of students on an eighty-day tour of Poland last May as part of curricula on the Holocaust, and another by Daniel D’Arpa (Spanish) about his trip with students to Spain in June. The week kicked off with a reception in the GO Center (Center for Global Opportunities), located in LA 119, where students are invited to learn about options for global studies through MCCC Study Tours and Semester Abroad programs. One student who stopped in was Liberal Arts student Kamil Stokes of Trenton. “I want to expand my horizons. I believe there are parts of me in other places and I want to find them.” The GO Center is open Tuesdays and Thursdays from 1:30 to 4:30 p.m.